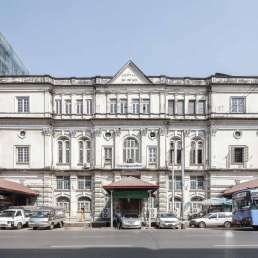 Built in the mid-1990s and opened in 1995, the FMI Centre was Yangon’s first major office building up to international standards. (It was followed by the Sakura Tower, which opened in 1999 and remains one of the best office spaces in the city). The rather unremarkable 11-storey building, here seen from 29th Street, hosts the offices of various local and international companies and organisations. The FMI Centre is about 50 metres tall, towering over the low-rise downtown area immediately to the south. The “Parkson” department store in the retail podium opened in 2013, after an extensive renovation by local SPINE Architects. The Malaysian brand expects to invest in several store projects across Myanmar in coming years. 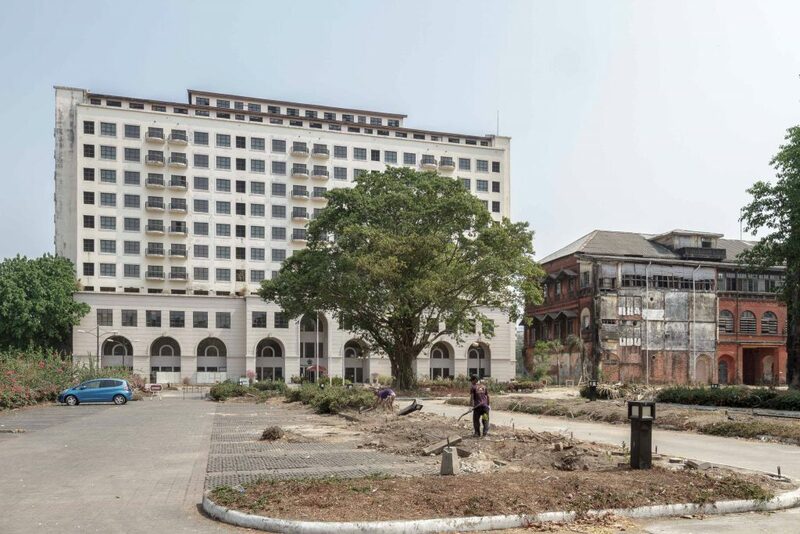 This relatively new building (by current Yangon standards) will soon have to make space for the “Landmark” project, with the former Myanmar Railways Company at its heart. The FMI Centre’s twin building, The Grand Mee Ya Hta Executive Residences, has already been vacated to make space. 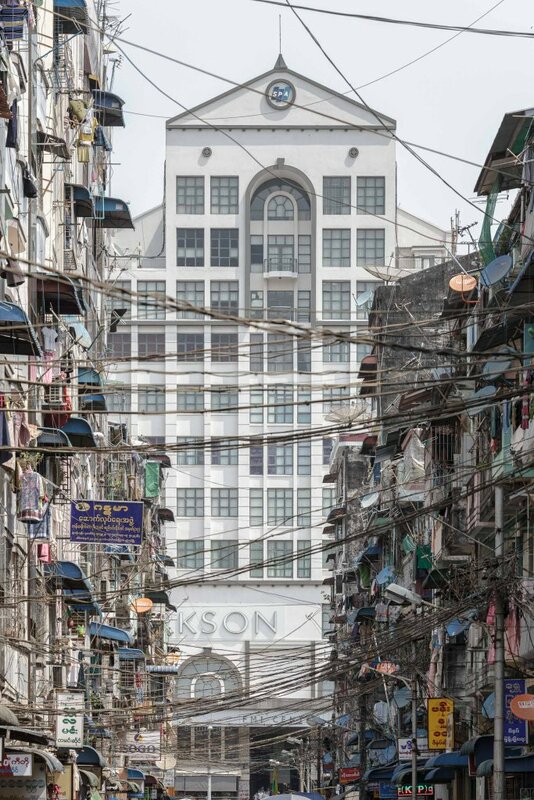 (By the time our readers venture through Yangon, it may be gone already.) The owner of the buildings and site is Serge Pun, one of Myanmar’s foremost businessmen. His many ventures include a banking group, a hospital, an airline, coffee plantations and domestic real estate. The latter earns the group the most money, and a few key projects provide the financial backbone to the thriving conglomerate. 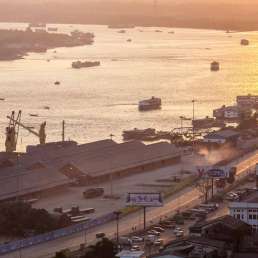 At the time of writing, the group’s major cash earner is Star City, a residential project in Thanlyin across the Yangon River. Landmark’s completion will fire the starting pistol for a new phase in the history of Yangon real estate. Budgeted at around 500 million US dollars, it will compete neck-and-neck with the mixed-use project of Vietnamese developer Hoang Anh Gia Lai, on Kaba Aye Pagoda Road, for the priciest-ever real estate deal in the city. Two of Landmark’s four projected towers (of about 80-100 metres each) will provide office space, while the other two will house a four-star hotel and serviced apartments. Aedas, one of the biggest architectural firms in the world, will handle the design. Early renderings reveal a generous use of glass and a connected retail area at the base of the four buildings, as well as swimming pools on their roofs. 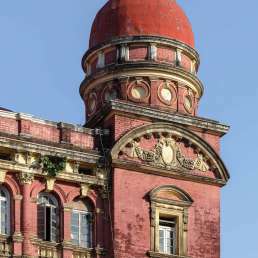 The four towers will flank the former Myanmar Railways Company building. The Washington-based International Finance Corporation (IFC), the private-sector arm of the World Bank, has committed 70 million US dollars to the overall project cost. The Asian Development Bank followed suit, approving the same amount. 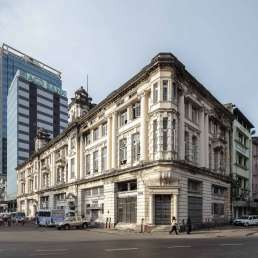 This sets Landmark miles apart from other major construction projects currently under way in Yangon, especially given the IFC’s stated attachment to transparency and accountability. The intention is to signal to foreign investors that the time to invest in Myanmar has come—and that trustworthy local partners await. Parts of Serge Pun’s business empire are already being traded on the Singapore stock exchange—to date, one of few ways for Western investors to gain exposure to Myanmar’s markets. But all may not be so rosy in the end. At the time of writing, the project is already late by about a year. Serge Pun has so far failed to secure a critical lease extension. The whole four-hectare site still nominally belongs to the Ministry of Railways; it says that it is still studying the application, telling the Myanmar Times that it was not “malicious in its intent or purposely trying to prolong the process”. Since Serge Pun began leasing the plot in the 1990s, only about 25 years remain on the current lease—too little to secure long-term investments. However, he remains optimistic the deal will come through, albeit in two stages. The first one will include the office, retail and hotel components. Then, once the extended leases are obtained, the residential part of the project will get underway. 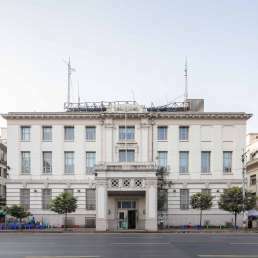 The big question is whether the international financial institutions will continue to support the project in the absence of this critical lease extension—and if it is granted, on the lease conditions. Yangon’s real estate market has run into major capacity shortages and a frenzy of construction activity is taking place throughout Yangon. But conditions are incredibly volatile: in February 2015, several major construction projects for commercial and residential space already under way were suddenly suspended due to concerns over their proximity to the Shwedagon Pagoda. In the meantime prices are astronomical, although the market is showing signs of cooling. Serge Pun himself believes a crash in prices is likely.